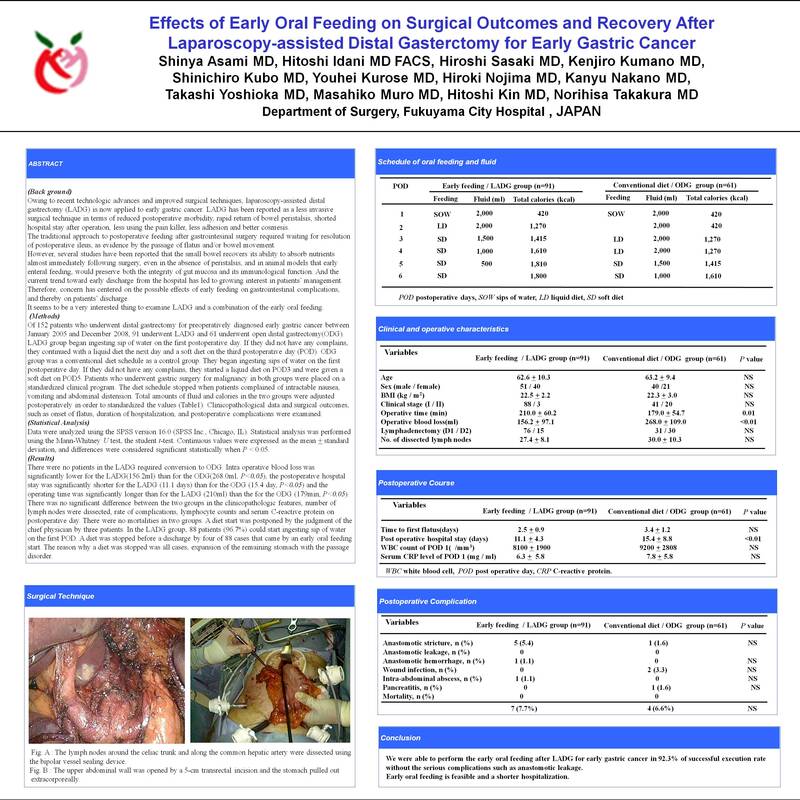 Effects of Early Oral Feeding on Surgical Outcomes and Recovery After Laparoscopy-Assisted Distal Gastrectomy for Early Gastric Cancer: A Nonrandomized Study. INTRODUCTION:Introduction: Traditionally, patients after gastric surgery are started feeding when flatus or defecation has documented the return of bowel function. However, in recent years for patients after colorectal cancer resection, early postoperative oral feeding has some favorable effects and has come to be accepted as a safe and feasible approach to management. The aim of the present study was to determine whether early oral feeding after laparoscopy-assisted distal gastrectomy (LADG) for early gastric cancer can be tolerated and whether it has an effect on short-term outcomes. METHODS AND PROCEDURES: Of 152 patients who underwent distal gasterctomy for preoperatively diagnosed early gastric cancer between January 2005 and December 2008, 91 underwent LADG and 61 underwent open distal gastrectomy (ODG). LADG group began ingesting sip of water on the first postoperative day. If they did not have any complains, they continued with a liquid diet the next day and a soft diet on the third post operative day(POD). ODG group was a conventional diet schedule as a control group. We evaluated the clinicopathologic features and surgical outcomes, including morbidity, laboratory results, and hospital stay between two groups. RESULTS: There was no patients in the LADG required conversion to ODG. Intra operative blood loss was significantly lower for the LADG ( 156.2ml ) than for the ODG ( 268.0ml, P<0.05 ), the postoperative hospital stay was significantly shorter for the LADG ( 11.1days ) than for the ODG ( 15.4 days, P<0.05 ) and the operating time was significantly longer for the LADG ( 210min ) than for the ODG ( 179min, P<0.05 ). There was no significant difference between the two groups in the clinicopathologic features, number of lymph nodes were dissected, rate of complications, lymphocyte counts and serum albumin on postoperative day. There was no mortalities in two groups. A diet start was postponed by the judgment of the chief physician by three patients. In the LADG group, 88 patents(96.7%) could start ingesting sip of water on the first POD. A diet was stopped before a discharge by four of 88 cases that came by an early oral feeding start. The reason why a diet was stopped was all cases, expansion of the remaining stomachs with the passage disorder. CONCLUSION:Conclusion: We were able to perform the early oral feeding after LADG for early gastric cancer in 92.3% of successful execution rate without the serious complications such as anastomotic leakage.